The year was 1800. It was an American election year—bitterly fought between the often-brooding incumbent John Adams and the tall, handsome, flashy Virginian, Thomas Jefferson. The stakes were high —a “conservative” federalist fighting for his political career against a godless populist—a “liberal.” It was a brutal campaign that ended in a victory for Jeffersonian democracy. The rancor of partisan politics was exceeded only by the rancor of doctrinal divisions. For those like the Rev. Adoniram Judson, Sr., a Congregational minister in Massachusetts who looked back nostalgically to the days when Puritans like Jonathan Edwards set the standard for ministers, modern ideas were now threatening the very core of orthodoxy. Rationalism was a plague, and it was contagious. John Adams had many years earlier been infected through an encounter with a Worcester lawyer. In his turn from Calvinism to deism, Adams did not ridicule religion as had Thomas Paine. But for him, religion was not a set of doctrines to be unraveled as true or false; rather, it was the glue that held good societies together. “One great Advantage of the Christian Religion,” he wrote in his diary in 1796, “is that it brings the great Principle of the Law of Nature and Nations, Love your Neighbor as yourself. … The Duties and Rights of The Man and the Citizen are thus taught from early Infancy to every Creature.” Politics and religion were tied together for the betterment of the nation. A religious and political conservative like Rev. Judson found himself in the minority. What was the future for those who clung to the doctrines and biblical teachings that had been passed down for so many generations? Would the religion of rationalism roll right over the beliefs he held dear? The future for “conservative” religion, he could not have realized, lay in the likes of his own son Adoniram, then growing into manhood. It would be an American “can-do” religion harking back to the traditions of old while at the same time entering into the democracy that both the elder Judson and John Adams had feared. Despite partisan politics, much of America was exultant and optimistic in 1800. The Revolutionary War, though now a quarter century dimmed in detail, was still a potent reminder of God's hand in human affairs. Indeed, Americans believed, it was God's faithfulness that had secured the victory—victory that demanded duty more than it proffered privilege. Jefferson was the man for the future, and democracy would prevail. Democracy in the political realm helped to create democracy in religion. With the birth of the Second Great Awakening, manifested in frontier revivals and egalitarian expressions of faith, democracy and religion were moving into the future together. New denominations were springing up overnight, and the democratic belief in the power of an ordinary person to make an impact in the world spawned numerous voluntary societies. Lady Liberty offered opportunities never before imagined. As the 19th century dawned, so did “manifest destiny”—a sense of God-given obligation to carry afar the tidings of democracy and freedom. The “city on a hill” metaphor of colonial Puritan times was given legs. America actively pursued new dominion and pushed its borders westward. At the same time there was an urge to turn this “manifest destiny” into what some have called a “Benevolent Empire” both at home and abroad—an empire of good works. Mission agencies were among the new voluntary societies. Indeed, by 1800, inspired by early missionary efforts in England, there was a growing wave of enthusiasm for mission outreach. In that year, Mary Webb, a wheel-chair bound, 21-year-old Baptist, formed the Boston Female Society for Missionary Purposes, which funded ministry to Native Americans and European settlers on the American frontier. Her organizational skills led to the founding of more than a dozen other benevolent agencies that provided for the poor such things as housing, education, clothing, day care, rehabilitation, and support for immigrants. In 1802, Mehitable Simpkins, another woman from Boston, introduced the fund-raising concept of the “cent” or “mite” society, which quickly spread throughout the Eastern seaboard. She was serving as the hostess for a dinner party where the topic of conversation turned to the needs of missions on the frontier. A guest commented that if every family contributed the cost of a glass of wine (one penny) each week, support for missionaries could be financed. Simpkins seized the opportunity, spread the word, and soon was deluged with pennies—pennies for the Massachusetts Baptist Missionary Society, of which her husband was treasurer. That same year, the society began sending missionaries to plant churches on the upper Midwestern frontier. Adoniram Judson was not among those students under the haystack, but he represents the answer to that rainy-day prayer. Unlike his father, whose generation was still a part of colonial New England, Adoniram was a child of the new nation, born in 1788, the very year the Constitution of the United States was ratified in Philadelphia. His childhood and young adult years were profoundly influenced by a spirit of optimism and Yankee determination. He was part of Lady Liberty's grand democratic march into the future that offered him the American dream of choices and freedom unknown in his father's generation. That dream led him to Burma, where he spent most of four decades with three wives (in succession), several loyal language helpers, and an ever-expanding Christian following. Meanwhile, in the land of his birth, a land increasingly enamored with celebrity, he became a legend—a hero for old and young alike. For 19th-century Christians, Adoniram Judson was the first American idol. "I called one morning at the house of a brother who took 'The New York Baptist Register.' The post-boy had just left the paper, and the brother's daughter was reading it in the room where I entered. … After spending a few moments in talking about the kingdom of Christ, I heard a deep sigh from the young woman … with her cheek bathed in tears, and handing me a quarter of a dollar (all the money she had) with trembling she said, 'Will you send that to Burma?' … Taking 'The Register,' and pointing to a letter, [she] turned away to weep." With the death of Ann in 1826, the compelling personal narratives ceased, but the stories of her selfless sacrifice served as devotional literature for young and old alike across denominational boundaries. It was the fascination with Ann through biographical writing that most effectively kept the Judson story alive during the two decades following her death. Judson's influence spread far beyond the borders of the Baptist churches and institutions. Indeed, from one writer's pen, the “joy in the land” was “not confined to the denomination with which he was identified. 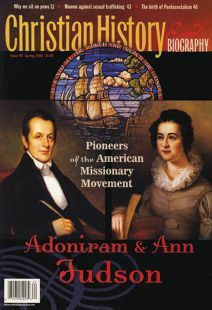 … Every religious community participated, and even those who took no interest in the cause of missions.” In a nation zealously marching outward and onward, Adoniram Judson had become both a symbol and a shaper of a new, democratic American religion—a religion and man who together influenced future generations of missionaries. This “joy in the land” would set the stage for continued growth of overseas mission activity in the latter half of the 19th century, followed by what is best described as the American Century of Missions—that grand 100-year experiment that covered the globe with the gospel. Ruth A. Tucker is associate professor of missions at Calvin Theological Seminary in Grand Rapids, Michigan, and the author of From Jerusalem to Irian Jaya.